Nikki Walker (Edinburgh Rugby) and Scott MacLeod (Newcastle Falcons) at Mansfield Park with Vice President Ross Cameron. Newcastle Falcons lock Scott MacLeod could be seen playing in a Green jersey again in 2016 if the Hawick rumour mill is as accurate as it usually is. The former Scotland second row joined the Robbie Dyes last season as part of a new-look coaching team installed by head coach Nikki Walker. And the former Teri admitted he was pleasantly surprised at how much he enjoyed that side of the game with the Greens. 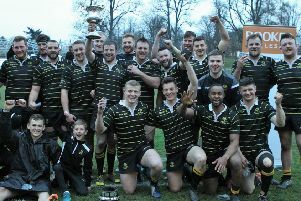 “I had a great first season coaching with Hawick, it was a real experience and one I never really thought I would enjoy,” he told The Southern. “We had a great playing and coaching group and a real bond between everyone which I think was one of the main factors as to why we managed to achieve what we did after a difficult season the year before. Speculation since the conclusion of the 15s rugby season has been that 36-year old MacLeod will combine his Newcastle Falcons player/coach role with a similar Hawick position. The former Hawick High School pupil, who still has one year on his Falcons contract, failed to rule out the possibility but remained tight-lipped on a what his future holds next season. “Coaching was never really a goal of mine, something I hadn’t really thought about, if I am honest, so when Nikki asked if I would be interested I was sceptical,” he added. “For me, playing is still my number one. I did at times find it hard when I was on the sidelines and I wasn’t able to get out there and help the boys.